Anime-zing Funtime Blog: Vacation Anime? First, before I get into the meat of this post, I just wanted to say I totally jinxed myself when I said "Work shouldn't be as demanding in the coming weeks" because I've had to spend several late nights trying to get deliverables to clients, and I was told the coming weeks are going to demand more time. So THAT'S why I'm paid with salary and not by the hour. This has seriously impeded my anime, video game, and just plain free time since Motaku. Le Sigh. Anyways, an interesting development is taking place the past week as far as anime is concerned. As you read from my previous post, I wasn't really planning to go to any more cons this year. The only ones that might happen are A2F - Fall edition, and G.A.M.E., though the latter is a gaming convention and not so much an anime con, which is why I haven't mentioned it on here. I doubt I'll be going to A2F this November because it will be a busy time, and there might be a new toy coming out that I will rather spend time with. Also, I think I'm supposed to be in Virginia for a week sometime soon for work, possibly, so those are the reasons I might not go to the fall festival. Unless they have a guest I'm dying to see, I will probably skip it and just return in the spring for the next one. If I decide to go, I'll definitely let you guys know. However, that interesting development I teased in the previous paragraph without talking about it thus making it a poor first sentence for said paragraph that I'm too lazy to fix, is that there is going to be another attempt at an anime con locally! 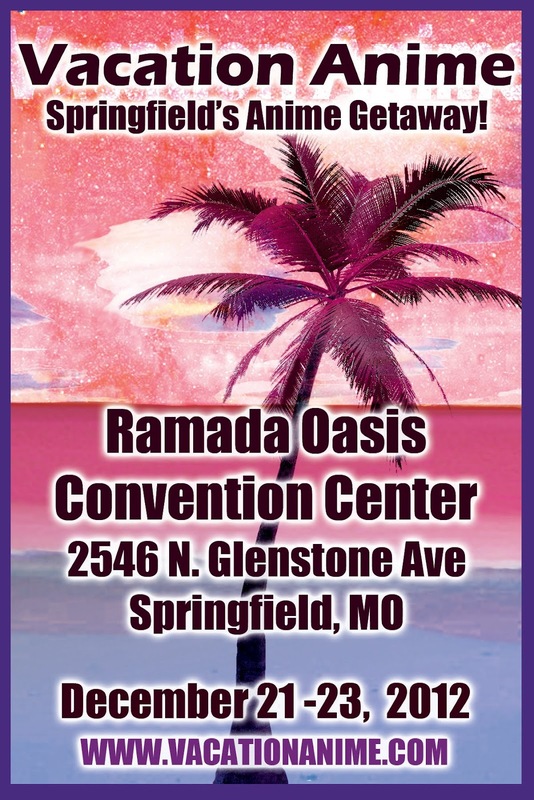 As I have previously posted, a couple years ago there was a push to get not only one, but two anime conventions in the Ozarks, but sadly they both went by the wayside over time. I had lost hope that just trying to get an anime social group started in the greater Springfield area would be impossible. Then, on the Facebook group I am a part of, someone posted about an upcoming anime con in the area. I was not getting my hopes up. So after doing some research, I found this guy. Honestly...I'm shocked. Something strikes me as odd about this convention. One, is that I have not heard about it until now. There are no listings for it on con sites, it does not come up in search engine results easily, and no one really seemed to know anything about it, even in those who seem more connected than I am with local events. Why is it being kept in the dark? Why isn't it listed anywhere? I would think the con would want word of mouth to spread, but oddly enough, not much is being said, which raises my suspicions of it happening at all. Two, are the dates, December 21-23. I know I'm new to the con scene, so let me ask this: Why is it on the weekend just days before Christmas? Won't it make it difficult to lock in guests? Also, the winter weather down here can be unpredictable, so there could be a risk of bad driving weather. I know that seems to be an odd issue to bring up, but consider this. This will be the first iteration of the con if it happens, and say that some bad weather happens that impedes traffic and prevents people from showing up. If the con doesn't pull in attendees, then the likelihood of it happening again are slim. Don't get me wrong, I want to see it succeed, but this concerns me a little bit. Interestingly enough, going off the news feed, this looks like it may be partnered with the same folks who do A2F. The reason I suspect this is two fold. First, the same guests seems to be lined up for both events, and secondly, the same name seems to be adding the news items on both sites. Am I overthinking this a little? Sure. But I'm hoping my investigative skills will pan out lucratively some day. So all in all, I want to see this happen. Am I holding my breath? No. When it gets to be a couple of weeks before the con, I will start getting excited. It has gotten this close to a con in the area before and I've gotten burned, so I'm going to see if it happens. If it does, you bet your sweet grits I will be there! Here's hoping. Anyone involved with the con or has more info on it, could you let me or others know? I will do my best to keep up to date on the news for the event!